4. When priming the sprayer, hold sprayer level to the ground. Sprayer may not prime if it is held at an angle. Once primed, it will spray in any direction. After use: 1. Twist sprayer nozzle completely to CLOSE position. 2. Turn hose plug switch clockwise to “CLOSED.” 3. Secure sprayer tip down in holster. 4. Failure to adjust nozzle completely to CLOSE position and properly secure sprayer in holster may result in leakage and damage to property or injury to people or animals. Before each use, inspect sprayer carefully — make sure hose is flexible and not kinked, worn or cracked, and that all connections are tight. Do not allow people or pets to touch treated plants until the sprays have dried. 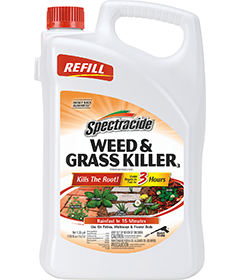 Spectracide® Weed & Grass Killer3 is pre-mixed and ready to use and is formulated for “spot” treatment of weeds and grasses. Use it on driveways and walkways, or around fences, trees, flower beds, shrubs and other areas in your yard.